During his 127-hour ordeal under that boulder, backpacker Aaron Ralston resorted to consuming his own urine in order to stay alive before eventually hacking off his own forearm and escaping. This was an extreme survival case, and pretty much the only time you should even consider drinking from your own spigot. Here's why. Urine is a nitrogen-rich liquid byproduct created by the kidneys—it's the body's primary means of expelling water-soluble chemicals generated through the metabolic process. Urine is actually a secondary waste disposal mechanism. Blood first passes through the liver where where toxins, dead cells, and various waste is removed and eliminated. then pumped through the kidneys where excess fluids and water-soluble molecules—nitrogen, vitamins, minerals, proteins, antibodies, and other metabolites—are extracted and transferred to the bladder to await expulsion. There's a misconception that urine is sterile when it exits your body. It's not. That myth began in the 1950s. Edward Kass, an epidemiologist at Harvard Medical, began screening pre-op surgery patients for urinary tract infections and the samples that passed were marked "negative." The notion that urine is sterile likely grew from those sample markings. It's close—your pee is roughly 95 percent water, 5 percent metabolites. But recent studies have shown that like the surface of your skin, the inside of your skull, and the depths of your bowels, your urinary tract is host to bacterial colonies. One such report from May, produced by a research team led by Evann Hilt of Loyola University of Chicago, found that small numbers of bacteria do, in fact, call your urethra home. The team suspects that the bacteria there behave much like those in the gut, with a mix of beneficial and detrimental bacterial species constantly vying for dominance. If that's the case, and your pee potentially contains beneficial compounds, why not have a sip? You wouldn't be the first. Urophagia, the practice of consuming urine, is more often called auto-urine therapy (or just urine therapy) by those that partake and has been an established practice for millennia. It was first described in the Damar Tantra, an ancient sanskrit text considered an offshoot of the canon Hindu scriptures, which promoted massaging the skin with fresh urine as a sort of cure-all. Subsequent texts suggest mixing it with food, liquid, or other medical tinctures as a cure for cancer. References to the practice have also been found in Egyptian and early Chinese medical texts—even the Aztecs reportedly used urine as a disinfectant (which is thought to be the origin of the urban myth regarding peeing on jellyfish stings—also a bad idea). The practice spread from the Indian subcontinent throughout the rest of Asia and into Western Europe by rise of the Roman empire. 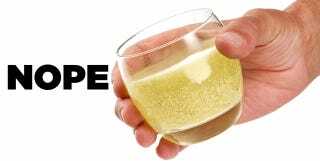 These days, urine therapy remains a popular homeopathic remedy in China where an estimated 3 million people tip a cup of piss to their own health. In America, urine therapy has gained a sizable following thanks to ringing endorsements from celebrated health experts and medical professionals like Madonna, who reportedly pees on her own feet to cure athlete's foot, as well as boxer Juan Manuel Márquez and MMA stars Lyoto Machida and Luke Cummo, who supposedly drink it for various perceived health benefits. Only three of those four get punched in the face for a living so this practice must be legit, right? More widely, consuming one's own urine (either as a topical ointment, nasal and ocular irrigator, gargle, or actually ingested) is claimed to cure everything from common colds and lethargy to cancer and AIDS. Amazon's virtual shelves are packed with pro-pee literature extolling urine as a self-produced wonder drug. With such miraculous benefits, you'd think modern medicine would be kicking down the bathroom door to get at this golden (shower) resource. Homeopathy advocates like Martha Christy, author of Your Own Perfect Medicine argue the reason that's not happening is that the medical community is conspiring to keep auto-urine therapy a secret since there is little financial profit for them in it. In reality, there has yet to be a rigorous scientific study confirming these benefits or even suggesting that they exist. In fact, a host of medical professionals have concluded that consuming your pee, using it as a tooth whitener (it does contain ammonia), or otherwise ingesting it is a rather bad idea. For example, peeing on jellyfish stings is counterproductive as the sodium in your piss can reactivate embedded nemocysts (the actual stingers) worsening the pain while the bacteria present in your urine are afforded a free trip into your bloodstream. There are some individual reports of urotherapy's ability to stop cancer growth. However, available scientific evidence does not support claims that urine or urea given in any form is helpful for cancer patients. Two small studies done during the 1980s found urea did not cause tumors to shrink in patients with cancer in the liver. It's not even considered a viable option when you've had your arm stuck underneath a boulder for three days. The Army Field Manual argues against it in survival situations as the sodium content of the pee will accelerate dehydration and Helen Andrews of the British Dietetic Association seems inclined to agree. "There are no health benefits to drinking your own urine, and in fact I think it could be quite detrimental. Each time you put it back it will come out again even more concentrated and that is not good for health as it could damage the gut," she told The Independent. "If you are stranded, your body will try to conserve as much water as it can. Drinking your urine would be like drinking seawater." Except, you know, less tasty.